Save 15% on the DKN HR Transmitter when purchasing this product! 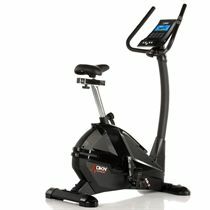 for submitting product information about DKN AM-E Exercise Bike We aim to answer all questions within 2-3 days. 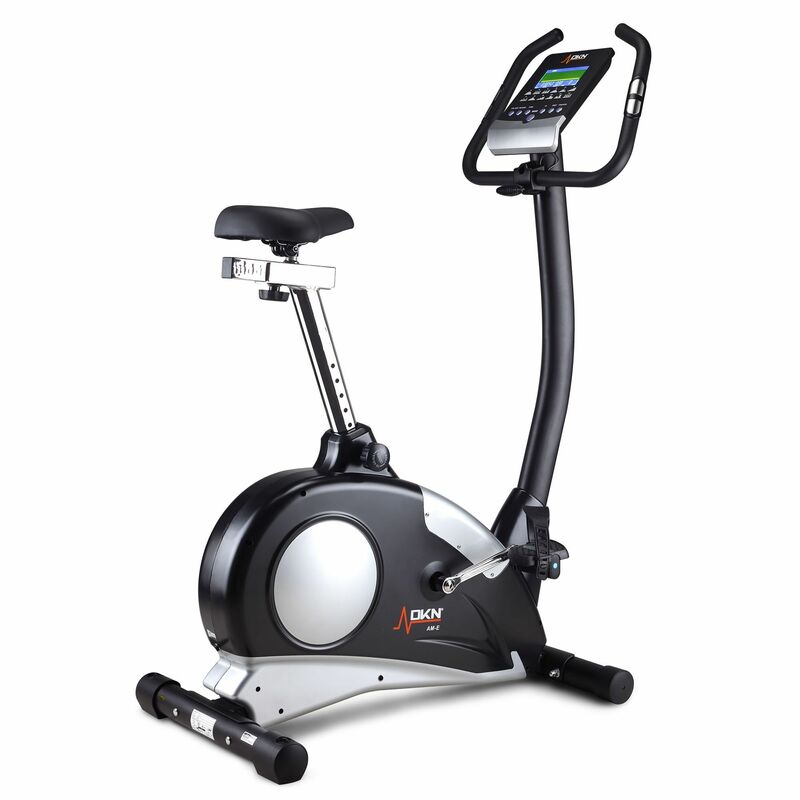 for submitting product information about DKN AM-E Exercise Bike. We aim to answer all questions within 2-3 days. If you provided your name and email address, we will email you as soon as the answer is published. The minimum height is 5ft (1.52m). What is the distance from the bottom of the handlebar to the floor? Hi, the distance from the bottom of the handlebar to the floor is 139cm (54.7"). What is the distance between the top of the saddle and the pedal, when the pedal is lowest and the saddle in max position? When the seat is fully extended to it's maximum height of 104cm (40.9"), the distance between the top of the saddle and the pedal in its lowest position is 96cm (37.8"). Does the bike retain its personal profile settings for each person when unplugged? Hi. Yes, absolutely. There are 4 user profiles enabling you to save gender, age, height and weight info for a more personalised feedback during each workout. Does this bike come with a warranty? Yes, it comes with a 2-year warranty. Is the bikes mains controled? Yes, this bike is mains powered. Hi, is the height in cm or inches and weight is it pounds or kilos? These dimensions are provided in both ways: the height is 135cm (53.1”), and the weight is 34.5kg (76lbs). What is the heaviest weight it can take? This exerciser has been tested up to a max. body weight of 140 kg/300 lbs. The bike is a safe workout option, however you should speak to your doctor before undertaking any exercise. Can I just sit on the bike and pedal and go up and down,resistance, without using a program? Yes you can. That is called manual mode and is an effective workout in itself as you can set the resistance level yourself. Is it safe for the bike to be used by someone fitted with a pace-maker? It's absolutely safe to use this product by someone fitted with a pace-maker. When making a user profile on the bike it asks for weight, but what metric is being used - KG/pounds stones etc? When creating a user profile on all DKN products the weight is provided in kg. Would this bike be suitable for a someone aged 52 who has never used one before and isn't very fit? 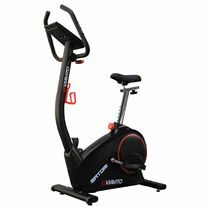 It should be OK as this Exercise Bike offers 32 levels of resistance enabling you to adjust the intensity of each workout. However you should contact your doctor before undertaking any exercise. Is this bike suitable for tall people? I am 6ft 3 inch. This bike is suitable for tall people, it will be great for you. Is it possible to pay extra to have the bike assembled? 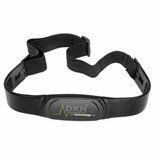 Is it compatible with a Polar heart rate monitor strap? 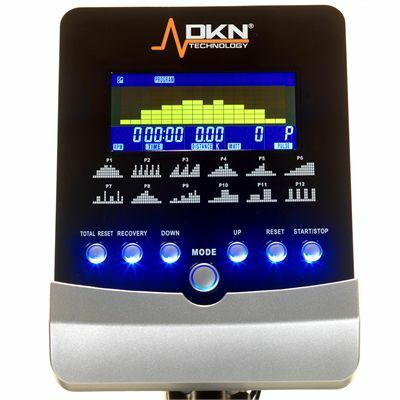 This DKN Exercise Bike is compatible with non-coded HR transmitters that operate on 5 Khz. Is the saddle comfortable (soft)? This DKN Bike has a gel saddle, which is very comfortable. Is the saddle stem the same size as a road bike? The stem is adjustable in height. This Bike is relatively quiet. Maximum what height man is suitable for? The maximum height is 6ft 3. How difficult is the assembly for one person? The Assembly of this DKN Exercise Bike is quite easy, it takes about 30 minutes. In the video the pillar that supports the handlebars, rocks from side to side and appears loose. Is this normal ? This is absolutely normal because it is absorbing the vibration. Can you programme your own workout on this for e.g. High intensity training or do you have to follow the pre-programmed sessions? The Bike includes 12 pre set programmes, however, there is one user mode programme which you can design to suit your requirements. Where does the adapter plug in to? The adapter plugs in at the rear bottom of the flywheel just above the rear stabiliser wheel bar. Do the pedals have a standard axel/thread? i.e can I swap them for spd pedals from my road bike? The AM-E Exercise Bike has standard thread, so the pedals can be changed. Do I have to buy the adapter separately? No, the bike is delivered with the adapter. Does this bike require to be plugged into the mains? Yes, this product is mains powered and will need to be plugged in when in use. What are the dimensions from the ground to the top of the seat when the seat is fully extended? Once the seat is fully extended to it's maximum height- The measurement from the ground to the top of the seat is 100cm (39.37"). How easy is it to move from one room to another? This bike has 2 transport wheels located on the front of the bike, allowing it to be easily transported from one room to another. Is this a magnetic resistance bike? Yes, the resistance mechanism is magnetic, with the resistance levels controlled electronically through the console. What programmes are available on this exercise bike? 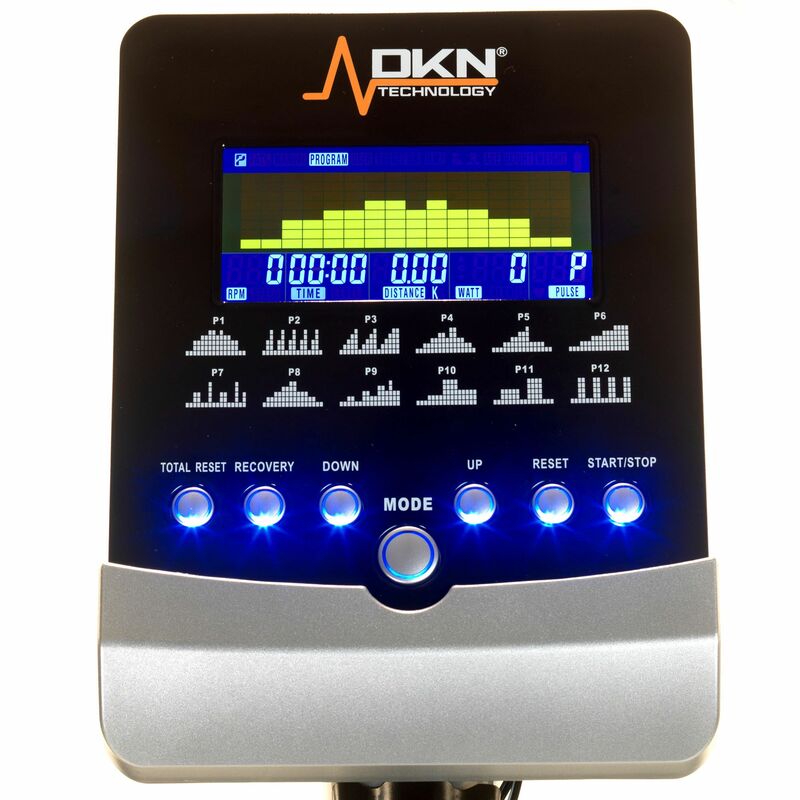 The DKN AM-E Exercise Bike features a manual, 12 pre-set programmes, as well as a user mode, target HR mode and a Watt mode to help you achieve the training goals faster. Is this bike available in the white/silver option? 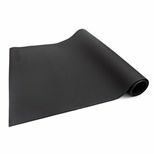 This product is available in the Black & Silver colour only. The white version was available earlier this year, but has since been discontinued. Really pleased. Bike is sturdy and feels well made. Very quiet in use and a range of programs which I think would suit most users. Seat is hard as others have said, but a gel cover has helped a great deal. Very good service from sweatband - bike arrived well packaged and on time. Overall, I think this is good value for money. Quality good and value for the price paid. Easy to assemble and comfortable seat . Program workout really function good. Really pleased with purchase. This is a great bike. Easy to put together and good quality. An all round great buy. Fast delivery would recommend to anyone. Overall, we are very pleased with this exercise bike. The reason I haven't given it a top rating is due to the vastly inaccurate readings provided by the electronic display. Having used exercise bikes for over 10 years, I reckon that this one over estimates calorie burn by about 250%, which makes the information supplied effectively useless. Further, as others have commented, the readout continues to change between elapsed time and programme level, and also between watts and calories every 6 seconds - this is quite annoying. On the plus side - and there are many pluses - the bike is extremely quiet, fairly easy for two people to assemble, has a good range of exercise programmes, and has 32 difficulty levels - I'm fairly fit, and level 28 seems to be my comfortable maximum ... level 32 is hard work. Less than level 22 is easy for me. Over all, for the price, this is a very good exercise bike. If the electronic readout was better, then it would be excellent. Brilliant product. It has exceeded our expectations. I would strongly recommend it. It offers different programmes and intensities of workout. Vert sturdy and stable. Very pleased with It. A friend had one. She had done all the research and was pleased with it. So bought on her recommendation. Am absolutely delighted with mine. Just wish I'd sent my old one to the tip sooner! A good solid machine, perfectly adequate for my needs and with enough feedback to keep me motivated. The graphics on the control screen look a bit dated now but i guess that's reflected in the price. This is the best exercise bike you're going to find at this price point, and you get a lot out of it. It's well made, sturdy, solid, comfortable, and sports a good set of programmes that you can choose in the monitor. It's very silent and doesn't move a bit while you use it. It isn't foldable, but you can move it around thanks to the wheels on one end. Using it is as easy as hopping on it and start pedalling. You can easily move and fix the seat and handles distance and inclination. It comes in pieces, but it's easy to assemble. I am really pleased with it. 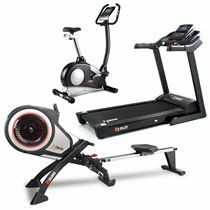 for submitting product review about DKN AM-E Exercise Bike.